Most of us men don’t grow up knowing how to be a great father or grandfather. 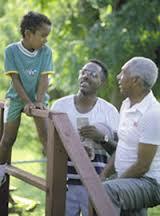 We certainly observe and learn from our own fathers and grandfathers as we grow and develop. If we’re fortunate we may have models before us of goodness, perhaps even greatness. And what is good? What is great? Most people, including wives, will judge men as good or great fathers and grandfathers with a scorecard that includes practical things like helping out with the diapers, the dishes, the trash, the house cleaning, the laundry, the homework, babysitting, the cooking, the baths, the bedtime routine. Of course, extra points are earned in the eyes of everyone around for that Dad or Grandfather who plays ball with the kids, teaches them a skill, invests time and attention in the kids and family beyond his normal responsibilities. I believe those are table stakes. That’s basic Dad 101, Grandfather 101. In other words, all men should be doing these things. And most are. According to Today.com, 54% of dads today change diapers – that’s up from 37% from their own father’s generation. Good for us, right? Well, sorta. That’s a high percentage. And expressing emotional support is certainly a good thing. But I believe there’s more to being a great father and grandfather than even that. I’ll be speaking tomorrow at the Ministry Alliance Network’s R3 Men’s Conference in San Jose, CA on this very topic: Fathering and Grandfathering, God’s Way. With 3 married children (ages 32, 30, 27) and 8 grandchildren, I’ve had the privilege of experiencing all of the above and can make some definitive observations and comments on the matter. If your worldview is godless or non-Christian, then stop reading and go on to something else. This won’t make any sense to you. That’s not to say that you aren’t or can’t be a good Dad or Grandfather. It’s just that you will be doing what most men in the world do in the raising of children: help them grow and develop and do and be the best they can to make the world a better place. Or something to that effect. Purpose. Again, I believe we are created and positioned here or earth to do more. We are to love and honor our Creator, the God of the Bible, the God of Abraham, Jacob, and Moses of the Old Testament. We are to be obedient and keep His commandments as Christ-followers under the New Covenant as described in the New Testament. With that we are to love our fellow man, our neighbor. Call to Action. We are each created and endowed with gifts and talents and designed for purposes for His intent, not ours. When we surrender our heart, mind, soul, and body to discovering that, then we blossom to fullness in fruit, output and yield. Discovery. We don’t often figure this out at age 7 or 17. But per God’s natural Male Growth Model (see BV Boys to Men – a Growth Model) we are on our way, a journey, which with God’s help and guidance, will lead to fullness and richness (not necessarily wealth) and wholeness and meaning for His purposes. By age 27, 37, or 47, or 57, if we’re paying attention through prayer and submission, we should be fairly clear on our patterns of gifts, talents, inclinations and motivations and the manifestation of those in vocation and livelihood, again ideally surrendered under His control and provision. NOTE: This does NOT mean the surrendered Christian is to go into ministry and work for a non-profit organization or be a pastor. God places men and women as kings of nations and businesses to prosper and achieve His plans and purposes. We are called to be “marketplace ministers,” not necessarily church ministers. It is not a special calling; it is the way of the Christian life. So What Makes a Great Dad or Grandfather? We are to submit ourselves to the authority of His Son, Jesus Christ, who died on the Cross and was resurrected, as atonement for our sins and through whom now we can be restored to relationship with our heavenly Father. We are to pray through the power of the Holy Spirit, for the accomplishment of God’s plans in and through us and our children, even unto future generations, to be blessed and to be a blessing for our home, community, nation, and world. So with that, we fathers and grandfathers have our plates full. We are, of course, to help out around the house and hold up our end of the load, and even better if we play ball and teach our young children and grandchildren to appreciate their unique skills and talents. But even more so, we are to teach them in their youth and young adulthood and remind them throughout their adult life, of God, the Bible, of life’s purpose, of Truth, of love, of reason and intelligence, of man’s sin and wickedness and redemption and restoration made possible by Christ, not a religion, but historically proven, of wisdom, of peace and joy, of prayer, of surrender, of hope and perspective, of a future and light beyond this present darkness. That is what a father and grandfather should do. Are you a great father and grandfather? Know a Proverbs 31 Woman?